This recipe is all about mayo! I came across this recipe when I saw that someone was burning miso, and I thought how did I not think about that! The sweetness from the butter notes is really highlighted in this aioli. You’ll want to put on everything! Working over a bowl, segment blood orange and slice pieces in half. Squeeze remaining juice into the bowl with segments. Add balsamic and olive oil and a pinch of salt. Gently stir and set aside. Heat a non-stick pan over medium-high heat. Season scallops with salt and pepper. Add a splash of oil and sear scallops for 1 ½ – 2 minutes, until deep golden brown. Add butter to the pan, flip scallops and sear other-side. Use a spoon to glaze scallops in butter. Cook for another 2 minutes and remove to a plate. 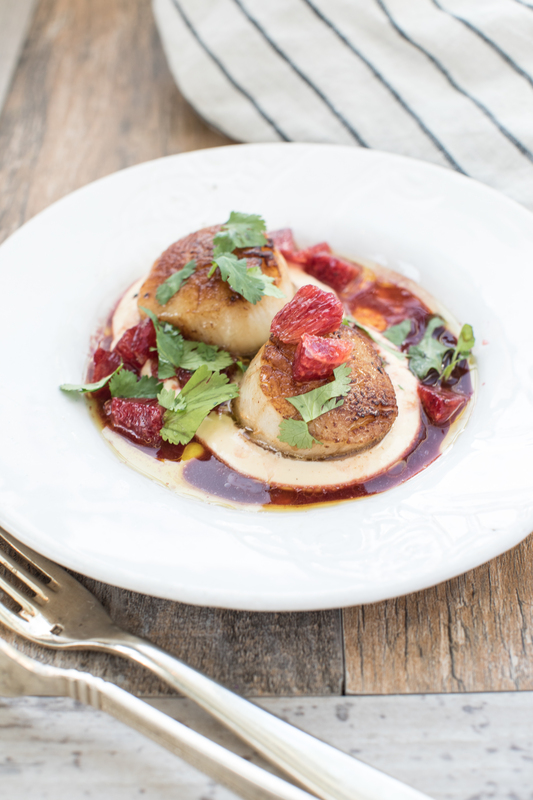 Spread 1/2 cup brown butter miso onto a plate, top with seared scallops and drizzle with blood orange vinaigrette and segments. Save remaining aioli for up to 4 days and use on a delicious grilled chicken dish, hamburgers or your favorite cut of steak! Heat oven to 350 degrees. Spread miso onto parchment paper and toast in oven for 5 minute increments, stirring and re-spreading each time. Once miso is a dark golden brown, about 10-12 minutes, remove from oven and let cool. Add all ingredients, except sour cream into blender. Blend on low until well stirred and butter and miso is broken up. Transfer to a bowl and whisk in sour cream. Salt to taste.